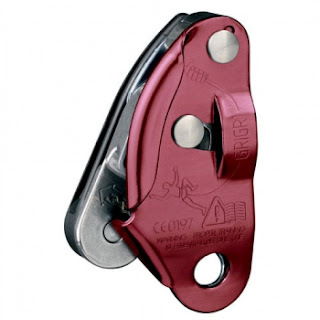 The GRIGRI's self-braking function helps the belayer catch and hold a climber, making it great for working routes. Works equally well for lead climbing and toproping. Ergonomic design makes for smooth, controllable lowers. Also great for rappelling on single ropes & perfect for setting and cleaning routes. Self-braking system: if the rope suddenly comes under tension (e.g. in a fall), the cam pivots to pinch the rope, thus helping the belayer stop the climber's fall. Usage is similar to that of conventional belay devices o giving/taking slack is done by using both hands to slide the rope through the device o falls are held by holding the free end of the rope with the brake hand o for lowering and rappelling, the rate of descent is controlled by the hand holding the free end of the rope (the rope is released with the handle).